First off thank you for all the nice comments on the Quilt Festival Quilt. You guys are GREAT, it makes my day to know that other people really like this stuff as much as I do. It makes me feel better about the fact that my floor hasn’t been vacuumed in six days and my sheets haven’t been washed in ___ days. I’m sparing you that number. Believe me. I finished up this quilt top last night with all of my colorful blocks put together. The hardest part was fitting all the blocks in there, balancing the colors, and not letting any 2 of the same color be next to each other. Heaven forbid that should happen. :) But I finally figured it out and I’m happy with it. I don’t love sewing sashings, its a little too boring for me, so I’m glad this top is done. The top measures 50” by 60”. Besides sewing, I’m attempting to improve my photo taking. I love taking the pictures, but it is the editing and printing, and what the heck do I do with all these pictures?? ?….that really gets me. I finally got a prime lens, which was a main reason for buying a Canon in the first place…..that was 2 years ago and I’m finally getting around to using it. So VERY slowly, but surely, I’m going to play with my photos more. And then there’s the scrapbooking…..and that’s a whole other problem. :) PS. I’ve received some questions I haven’t been able to respond to…so if you have a question you want answered use my email at the top of the toolbar on the right. My computer still won’t let me comment on blogger blogs with embedded comments (blogger says its our IP?) so if you leave your email I’ll get back with you! The Quilt looks great. So bright and cheery. You think sewing borders and sashing is boring? Try it without a machine! Every time I get to that part I consider buying a machine. I LOVE your quilt! I found your blog a little bit ago and love all of your neat projects. That top is beautiful! I love the colors in it and the funkyness. Yes, sashing, and binding are SO boring! Love the pic with the boy! 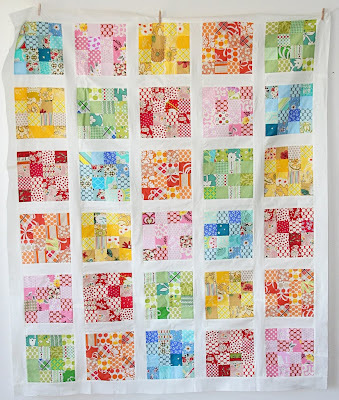 I love it, and using up scraps is a bonus :) I’ve been really liking all of the quilts that have white sashing on them, they look so bright and happy. I have several planned out to do now. You did such a nice job on this. My house is a disaster right now too, after sewing all weekend, everything got ignored. Your picture is really pretty too! love, love, love the quilt top!!! so much so that i want one of my own!!! go you and your picture taking. I think this is going to be one of my favorites yet…! Very fresh! And don’t you love a prime lens? I have a Nikon, but those lenses just seem to make your pictures artsy without even trying. looove this! It is so bright and cheerful! such happy colors! i love it. and i’m with you on the sashing. ugh. i did a lot of sashing this weekend too and i’m glad to be done with it! I love your quilt top! It’s one of my favorites. Looks like a lot of work, but so worth it. What are you going to do with it? I love your quilt. Such happy colors. I have a million scraps and you’ve inspired me to try my hand at something like this. Can you tell me how big your individual squares are? I was thinking maybe 2″ but that seems small for it to turn out 50 across. Thanks. i adore this quilt. i been itching to do something like this with some vintage sheets i have. Lovely image and lovely quilt! I also hate sewing on sashings! It is fantastic – so bright and happy! ADORBALE!! Where do you find the time with little ones? Im assuming the lil one in the photo is yours…. that has to be my biggest challenge. Seesh! Super moms! Great quilt colors! And the photo – I love how you edited it so that it is nearly B&W with just the red. It is composed quite nicely, too. Very cool. I love, love, love the quilt top! Beautiful! Love It!! It is so bright and cheery!! I am new to your blog and to quilting. Just getting my feet wet but I am so enjoying all I am learning and reading on various blogs. Your work is so nice!! !Thanks for the inspiration!! I’m with you on sashings, but sometimes it is just what the quilt needs. Looks great! this is beautiful! I love the bright colors! Beautiful! You did a really nice job! I know what you mean, when I get something laid out the way I think it should be, I call in my sweetheart to tell me “Too many reds in this corner” or “Those two shouldn’t be next to each other”. It’s like a puzzle sometimes! i. love. that. quilt. top. What a cute picture of your little boy! Looks like fun! Cute quilt! Love the color and the white sashing makes each block look special. This reminds me of a mosaiac quilt I made a few years ago. It remains one of my very favorites. I dont’ much like sashing either. It is so boring. But. I like the effect when it is done. Your quilt turned out really lovely. love this!!! i’m not much for sashing either. it’s so scrappy and fun! Swoon. That top is beautiful! very nice. I love this quilt. And I love that picture. You are so talented. Wow! This was a popular post! :) I love the quilt. It turned out beautifully! My computer still won’t let me comment on blogger blogs with embedded comments (blogger says its our IP?) so if you leave your email I’ll get back with you! Very beautiful! All your quilts are pure fun to look at.